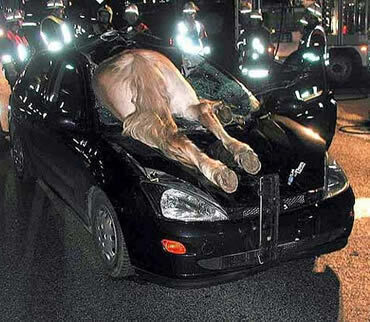 Two horses escaped from a corral and were hit by an automobile, killing the driver. The issue was the standard of care by the owner of the horses and the suitability of the gate latch used to contain the horses. 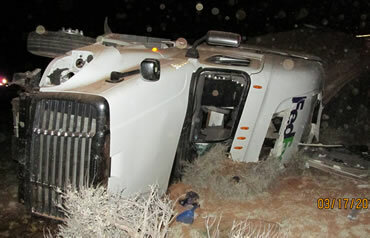 A bull escaped from a pasture and was hit by a truck, resulting in damage to the truck and nearby structures. The issue was the suitability of the fence used by the bull’s owner. A horse became entangled in a fence and was injured. The horse owner sued the fence manufacturer for selling an unsafe fencing system. Several cows escaped from a pasture and were hit by an automobile, killing the driver. The issue was the failure to immediately repair the fence containing the cattle after it was knocked down by a neighbor clearing brush. A bull escaped from a loading chute and injured a bystander. The issue was the actions of the auction facility’s employees and the design of the loading chute. A cow escaped from a ranch and was hit by a car, paralyzing the driver. The issue was the lack of fencing on a portion of the ranch adjacent to a major highway. A rider injured her ankle while riding her horse in an arena at an equestrian facility. The issue was the design of the fence that enclosed the arena. 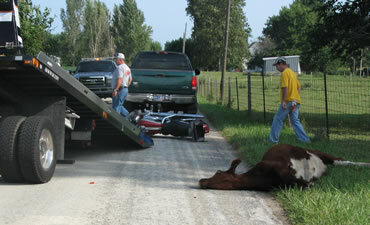 Several cattle escaped from a dairy and were hit by a motorcyclist, killing the rider. The issue was the condition of the fencing containing the cattle. A farmer applied herbicide that allegedly killed trees on the adjacent property. The issue was the loss of income due to the loss of shade from the dead trees.